Our modern, wheelchair accessible family dental office in Etobicoke is fully equipped to care for your family's dental needs. 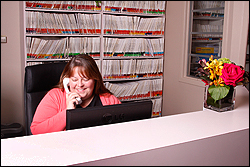 From your child's first visit, to the smile enhancement service you might be contemplating, we do it all with a smile. If you have any questions regarding a dental procedure, or any other oral health issue, please feel free to use the form below to contact us. We're happy to hear from you. As a courtesy we require a minimum 24 hours notice for a cancellation or changes to your appointment or a fee may apply. If you are experiencing a dental emergency during office hours, please contact our Etobicoke dental office at (416) 621-0360. Notice: Scheduled appointment changes must be made by phone and WILL NOT be accepted through this form.